Renowned for the beauty and simplicity of his teachings, Ajahn Chah was Thailand's best-known meditation teacher. His charisma and wisdom influenced many American and European seekers, and helped shape the American Vipassana community. This collection brings together for the first time Ajahn Chah's most powerful teachings, including those on meditation, liberation from suffering, calming the mind, enlightenment and the 'living dhamma'. Most of these talks have previously only been available in limited, private editions and the publication of Food for the Heart therefore represents a momentous occasion: the hugely increased accessibility of his words and wisdom. Western teachers such as Ram Dass and Jack Kornfield have extolled Chah's teachings for years and now readers can experience them directly in this book. Ajahn Chah (1918-92) was part of a movement to establish simple monastic communities in the remote forests of Thailand. At this date over one hundred forest monasteries have been established that look to his teaching as their inspiration. Ajahn Chah's simple yet profound style of teaching has a special appeal to Westerners, and in 1979 the first of several branch monasteries in the West was established in England, and there are now more than ten monasteries in the United States, Europe, Australia, and New Zealand. "Ajahn Chah was a prominent teacher in the Thai forest-dwelling tradition. Beginning in the mid-sixties, many Western students, including Jack Kornfield, studied with him at Wat Pa Pong. This anthology arrives on the tenth anniversary of Ajahn Chah's death. The talks in it cover a wide range of dharma topics, and have been skillfully translated and edited to preserve the vibrancy, directness and humor that he was known for. Though Ajahn Chah taught for over thirty years, his talks, unfortunately, were not systematically recorded and transcribed, which makes this collection from Wisdom all the more precious." "Like an expertly prepared and artistically presented feast, this compilation of Ajahn Chah's talks offers a tasty treat for just about anyone traveling the path to freedom. We see a master at work: Ajahn Chah offers teachings in his signature no-nonsense style, using simple language, humor, and delightful similes. One feels lifted up by the strength of his character, his unfailing confidence in dhamma, and by his earnest encouragement. This is one of those books that can be opened to any page to find a wise teaching. And at its end, one comes away with the feeling of having enjoyed a great meal." "Ajahn Chah spoke no English, yet his deep clear teachings motivated thousands of Westerners to embrace the simple profundity of living Buddhism. In this book, you'll find Ajahn Chah's unique wisdom, which shone brilliantly from the stillness of his mind. These words will inspire, guide, and liberate you. It is Buddhism at its best." – Ajahn Brahm, author of Who Ordered This Truckload of Dung? "The Buddhism practiced in northern Thailand has grown in popularity in part because of its gifted leader and speaker, the late Ajahn Chah. This compilation of his talks extols the virtues of practice and makes judicious use of the technical vocabulary of Buddhism. Ajahn Chah's humorous, analogy-laden narration of his tradition's practice--a practice that is basic and almost reductionistic, similar to modern Zen--makes these teachings accessible to beginners and appealing to serious practitioners. A valuable collection of the Thai Buddhist master's thoughts." "Ajahn Chah's wisdom, charisma, and simple teachings have had a profound effect upon the development of the Vipassana community in the West. Published on the tenth anniversary of his death, this collection brings together for the first time the dhamma talks of Thailand's best-known meditation teacher and forest monastic, talks previously available only in rare or limited editions. It presents Ajahn Chah's teachings on meditation, liberation from suffering, calming the mind, enlightenment, and the 'living dhamma'." "Includes nearly forty teachings divided into three categories: conduct, meditation, and wisdom. Ajahn Chah presents these teachings in his beautifully simple and heartfelt style." "Ajahn Chah's teachings are simple, clear and profoundly helpful. This book is a great contribution to the Dharma in the West." "Ajahn Chah's words have the sharp sting, salty tang and sand-dry wit of the old Zen masters. They will provide illumination and inspiration for all students of Buddhism." "This rich collection is a real treasure. 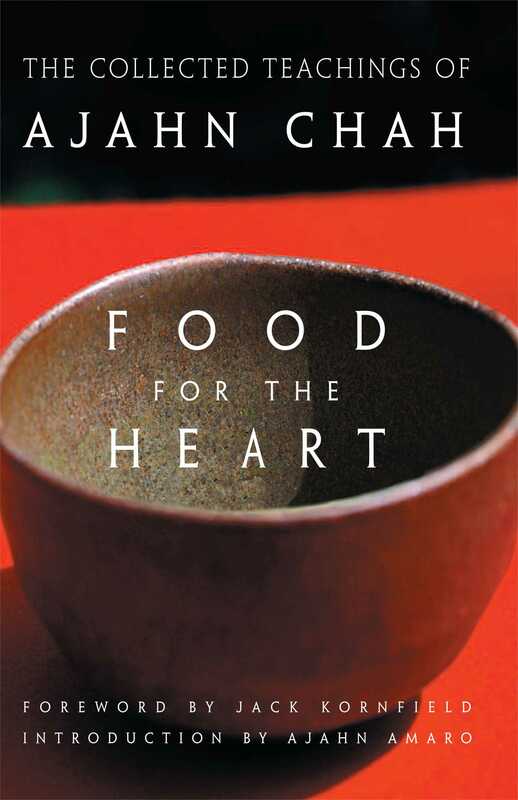 Profound, direct, earthy, and often funny, Food for the Heart will be especially precious for practitioners of vipassana meditation in all Buddhist lineages." "Ajahn Chah stands out as a profound teacher in the best of Buddhist wisdom traditions. Compassionate, lucid, and far beyond any sectarian categorizing, Food for the Heart is all that and more. This humble and down-to-earth forest monastic has given us all a work which will stand the test of time with the world's great classics of spiritual literature. An important volume for all serious followers of the Way."